As a mobile journalist, I have spent the past 3 days in southwestern Utah reporting for the Salt Lake Tribune on the 2010 Flood in the St. George area. I also had a few reports via telephone for Utah Public Radio. My boss told me to expect a call from them. That was my first time doing news reporting for a radio station. Here is the file from my UPR interview to listen to below. Below is a chronicle of what I did down there. Lots of pix, video, and stories being told. Here is the most recent story I wrote along with some other fellow reporters down in St. George. I learned there are more than 400 dams in Utah, with the majority being earth-filled. Dam was holding as of Wednesday morning. The first story we wrote after getting down to St. George. Here are a few fun videos and interesting pix I took on my cell phone of crazy waters, that didn't damage any homes, but looked pretty awesome, nonetheless. Three whirlpools in New Harmony in the Harmony Heights subdivision. (click the whirlpools text to see the video). Also video of one whirlpool closer up. This bridge at at the base of the subdivision was not in danger, but further up a few bridges or culverts were in question. Residents said the night before water was actually flowing over the road. A couple TV stations reported that this bridge was the one city officials were worried about, but that was incorrect. It was a different bridge further up the mountain. Residents in Toquerville and prison inmates, yes prison inmates form Purgatory Correctional Facility were being bussed in who were helping fill sandbags. Water came close to some homes, but looks like they were safe after sandbagging. Toquerville private residence was getting help from sandbaggers. Here the night before in Washington City, water was being pumped out of the storm drains and back into the Virgin River. The streets were flooding because the water from the river was blocking the drains from actually draining. Some homes were sandbagged, but ended up being safe from any flooding damage. In the city of Ivins water was spilling over the backside of Snow Canyon. It was gorgeous. This pic doesn't quite capture how awesome it was. This is the superficial erosion on the exterior of the South Creek dam, where the initial concern was raised on Tuesday morning. The dam ended up being fine, despite initial reports of it leaking. This is a pic of where the 9th hole of a golf course once was at South Creek golf course. The link to the story about how the flood affected the community recreational areas. I contributed to this story, with reaction from clients at Southgate. Here is a picture I took of a road washed out completely on the way up to the dam in Enterprise. Along with the live streaming video I took outside of the courthouse, I helped out with this final story on the guilty verdict for Brian David Mitchell who was on trial for the 2002 Elizabeth Smart kidnapping. 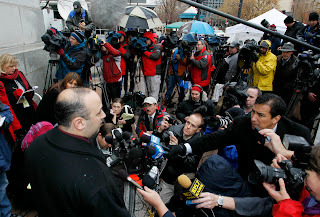 Below are pictures of me along with numerous other journalists from around the nation at the event. Photos were taken by the Salt Lake Tribune, AP, and Reuters. (Bottom_Left) Me and the back of my head. I am in a leather jacket taking video comment from Ed Smart, after his daughter Elizabeth, and wife Lois just finished speaking. (Bottom-Center) Holding up a digital voice recorder along with the cell phone camera, recording a live video feed to the newspaper's website. Mobile Journalism in action. You can see my Droid Incredible and my hand in the far right on this shot. 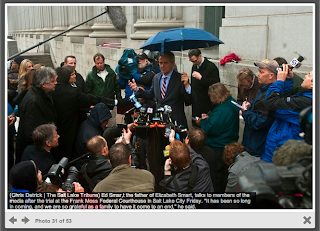 I was streaming live video to the Salt Lake Tribune's website of the reaction from the defense. I have been covering the Elizabeth Smart kidnapping trial since it began in November, right around the time I came on board at the Salt Lake Tribune. It has been a wild ride. I have really enjoyed getting involved in coverage of this case. I have learned more than I ever wanted to know about psychiatry and mental health, but have really enjoyed the opportunity it provided to learn more about the federal court process as I cover crime and justice. 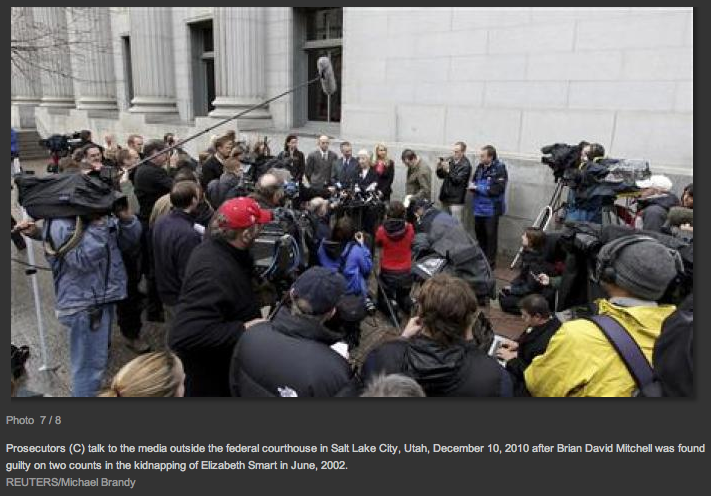 On December 10, 2010 Elizabeth Smart and her family commented after a guilty verdict is handed down by the jury for Brian David Mitchell for the 2002 kidnapping of Smart. Eight years after the event, closure comes for the family.